27th March – The Architecture of Maggie’s. 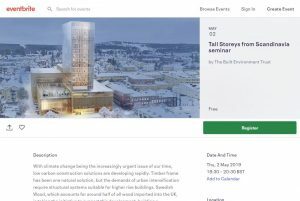 This seminar, which will be attended by over 200 UK architects, will present some of the latest multistorey buildings in Scandinavia, as well as relating them to developments in the UK. It will be chaired by Andrew Waugh, of Waugh Thistleton Architects, well known for their pioneering work on CLT multistorey residential buildings in Hackney. 27th March 2019 – Explore Offsite Housing. Explore Offsite Housing is a one day conference and exhibition creating a platform for construction clients and their professional advisers to explore the latest offsite construction solutions, providing a dynamic and interactive learning experience for all visitors. This event will consist of a conference of circa 180 delegates and an exhibition of circa 25-30 companies from a range of offsite technology providers including; timber frame, light steel frame, precast concrete, bathroom pods, volumetric buildings, building services plus CLT, glulam and a range of hybrid technologies. This event s is aimed at attracting construction clients; construction professionals: architects, architectural technologists, designers, surveyors, engineers; facilities managers; building product manufacturers and suppliers. 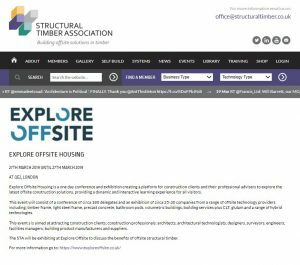 The STA will be exhibiting at Explore Offsite to discuss the benefits of offsite structural timber. 30th March 2019 – Public weekend tour and woodcut printing workshop. 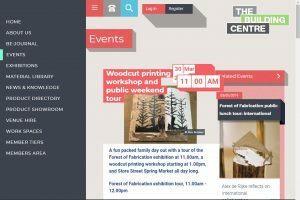 A fun packed family day out with a tour of the Forest of Fabrication exhibition at 11.00am, a woodcut printing workshop starting at 1.00pm, and Store Street Spring Market all day long. Join dRMM director Alex de Rijke for our Saturday guided tour. The conversation will focus around the studio’s approach to using the minimum amount of material to achieve maximum effect. Projects featured include dRMM’s Stirling Prize-winning project, Hasting Pier, and proposal to build a 36-storey interlocking CLT tower. 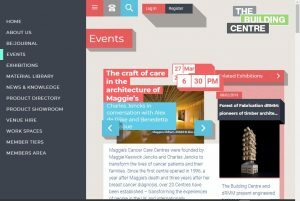 Registration for the exhibition tour is free but spaces are limited. Please book to avoid disappointment. Time: Tour 11:00 – 12:30pm & print workshop 1:00pm – 4:00pm. 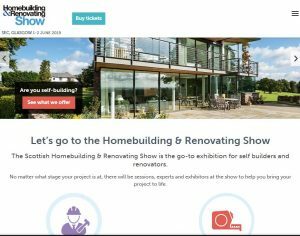 28th to 31st March 2019 – Homebuilding and Renovating Show. 3rd April 2019 – Re-Imaging Timber Symposium. Timber is one of the oldest building materials in the world and, if sustainably grown, is an endlessly renewable and natural resource. It offers those who design, make and build with it countless benefits including material flexibility and innovation. For those who live, work or play in a timber building it brings greater health and wellbeing. However as a material, it can still be misunderstood. Registration will open at 1.30pm for a 2.00pm start. The talks will conclude at 6.30pm with a networking drinks reception and a tour of the Forest of Fabrication exhibition by co-curator Alex de Rijke. 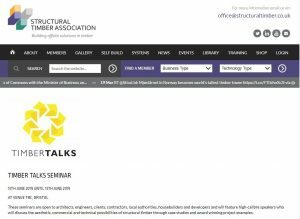 4th April 2019 – Timber Talks Seminar. 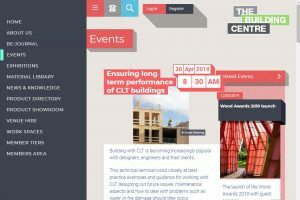 30th April 2019 – Ensuring Long – Term Performance of CLT Breakfast Event. Building with CLT is becoming increasingly popular with designers, engineers and their clients. This technical seminar looks closely at best practice examples and guidance for working with CLT, designing out future issues, maintenance aspects and how to deal with problems such as water or fire damage should they occur. Learn from the UK’s leading experts in CLT design and construction and benefit from their vast experience in delivering engineered timber buildings. 2nd May 2019 – Tall Storeys from Scaninavia. 9th May 2019 – Business as Usual for CLT. An event examining the impacts of new legislation for tall buildings. 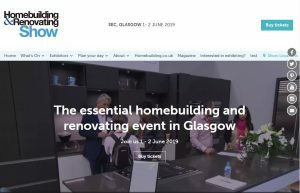 16th to 17th June 2019 – Homebuilding and Renovating Show – Glasgow. If you’re based in Glasgow, this is the essential homebuilding and renovating event. No matter what stage your project is at, there will be sessions, experts and exhibitors at the show to help you bring your project to life. Seminars galore, tons of exhibits and an advice centre to boot! 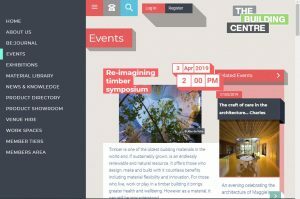 18th June 2019 – Sustainable construction with Cross-Laminated Timber. Building with timber systems has never been more topical in the UK: as a solution for sustainable construction; as a way of revolutionising programme velocity, building accuracy and on-site labour requirements; and as a way of creating healthy buildings to live in. But the new building regulations pose specific challenges for timber structures in residential buildings over 18m high. Structural engineers are at the heart of providing solutions to allow architects to create the sustainable buildings our cities need. 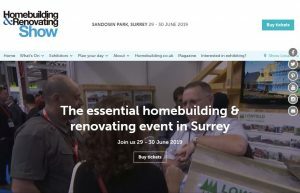 30th to 1st June/July 2019 – Homebuilding and Renovating Show – Surrey. If you’re based in Surrey, this is the essential homebuilding and renovating event. No matter what stage your project is at, there will be sessions, experts and exhibitors at the show to help you bring your project to life. Seminars galore, tons of exhibits and an advice centre to boot! 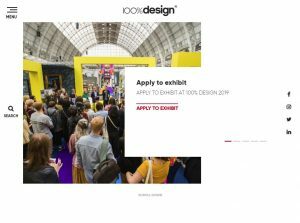 19th to 22nd Sept 2019 – 100% Design. The Olympia in London will play host to the UK’s largest trade event for architects and designers this September. Emerging brands, designs and materials are brought together along with a wide range of exhibitors. 24th Sept 2019 – Offsite Expo 2019. 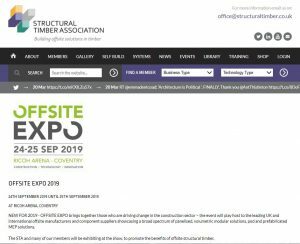 NEW FOR 2019 – OFFSITE EXPO brings together those who are driving change in the construction sector – the event will play host to the leading UK and international offsite manufacturers and component suppliers showcasing a broad spectrum of panelised, volumetric modular solutions, pod and prefabricated MEP solutions. 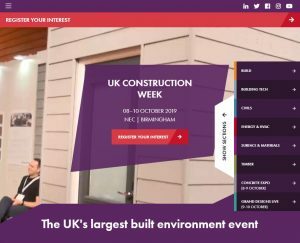 9th to 11th Oct 2019 – UK Construction Week. The multi award-winning UK Construction Week (UKCW) is back. FREE to attend for trade visitors and consisting of nine shows: Timber Expo, Build Show sponsored by Easy-Trim, Civils Expo, Plant & Machinery Live, Energy 2018, Smart Buildings 2018, Surface & Materials Show and HVAC 2018. This year boasts seminars, free building safety workshops and even a beer and ale festival. Cheers! 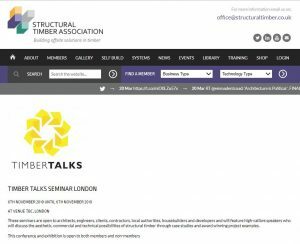 6th November 2019 – Timber Talks Seminar London. 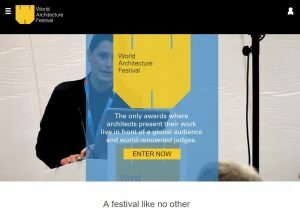 4th to 6th December 2019 – World Architecture Festival. At the heart of the Festival sits a unique awards programme. It is the only architecture awards where architects pitch their work to a panel of expert judges and their peers – all live at the festival in Amsterdam. Gain global recognition and invaluable feedback on your projects by submitting your completed buildings and future projects across multiple categories.